Eve Drewelowe Educated: University of Iowa. BA: Graphic and Plastic Arts. MA: Painting - First Masters in Painting [Conferred? ], U. of I. 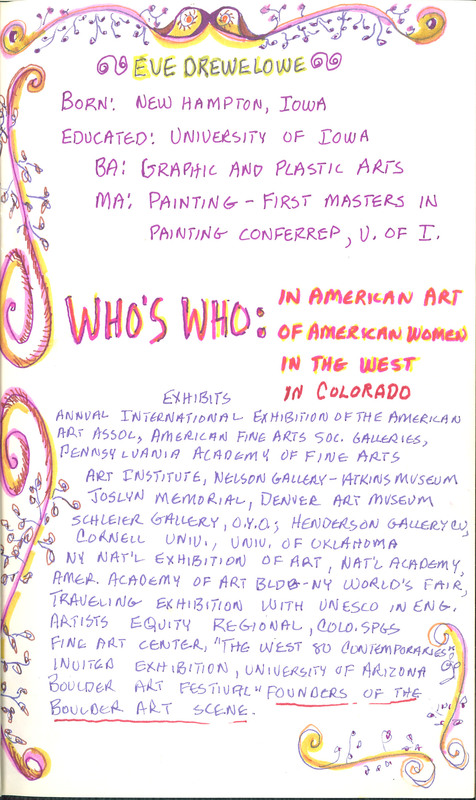 WHO'S WHO: In American Art, Of American Women, In the West, In Colorado. Exhibits Annual International Exhibition of the American Art Assoc, American Fine Arts Soc. Galleries, Pennsylvania Academy of Fine Arts Art Institute, Nelson Gallery--Atkins Museum Joslyn Memorial, Denver Art Museum Schleier Gallery, O.y.A, Henderson Gallery, Cornell Univ., Univ. of Oklahoma, NY Nat'l. Exhibition of Art, Nat'l Academy, Amer. Academy of Art BLDB -NY World's Fair, Traveling Exhibition with Unseco in Eng. Artists Equality Regional, Colo. Spgs Fine Art Center, "The West [80?] Contemporaries," Invited Exhibition, University of Arizona Boulder Art Festivals, Founders of the Boulder Art Scene.